Additionally, principal players Michael Terry (k) and Scott Parker (g) found some early material recorded in rehearsal studios. These include Someone Stole My Love Tonight, Second Hand Eyes, and The Ringmaster. There are also some live track recorded at Radio City in Anaheim: Back to Beyond and Magick. This disc ends where it began with the original recording of Midnight Fantasy dating to 1980. 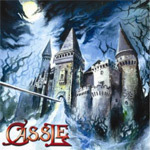 Cassle and Midnight Fantasy remind of early metal influenced by the heavier rock of the day and the winds of NWOBHM. The nuances, however, are their nascent progressive style. Cassle were not afraid to experiment with time and key changes. These elements make Midnight Fantasy, Revenge, Ringmaster and the later live tracks Back To Beyond and Magick the better material here. The other stuff is passable, but of little interest. Without doubt, Terry and Parker were both talented musicians and on to something interesting. They would labor for another seven years writing much material that would never reach light of day. Like many of the undiscovered and unsung bands of yesteryear now recently rediscovered, Cassle's Midnight Fantasy is sometimes novel and persuasive. As to their legacy in early American heavy metal history? It lies in the hearts of the band and their fans.